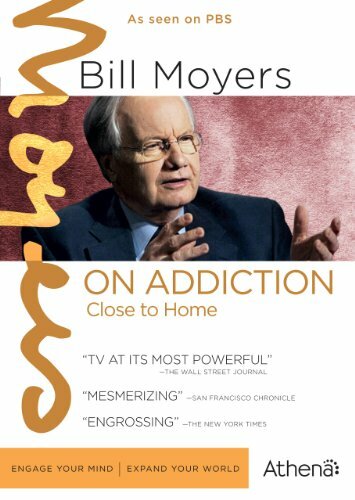 Silver Spring, MD -- An in-depth exploration of the heartbreak of addiction and the hope and possibility of recovery, the 1998-PBS-broadcast documentary, Bill Moyers on Addiction: Close to Home arrives to DVD from Athena on July 17, 2012. Legendary Emmy(R) and Peabody Award-winning journalist Bill Moyers (PBS, NBC, CBS) tackles the complex issues surrounding addiction in this five-part documentary. Featuring interviews with recovering addicts, scientists, and treatment professionals, the program offers a far-ranging, frank, and compassionate look at addiction. Bonus features include "Rebuilding Lives" from NOW with Bill Moyers on activist and former addict David Lewis (18 min.) and a 16-page viewer's guide with an introduction by Bill Moyers ($49.99, 5 Episodes, AthenaLearning.com). Close to Home is Athena's twelfth release from Moyers' acclaimed library of programs. Addiction can happen to anyone. It is an equal opportunity disease, crossing boundaries of race, creed, and class, destroying individuals, families, and communities. Most Americans have been touched by addiction, including renowned journalist Bill Moyers, whose oldest son struggled with drugs and alcohol. In this acclaimed five-part series, Moyers looks at substance abuse from all sides: personal, professional, scientific, and political. First, we hear from the real experts: recovering addicts. Then, Moyers talks with scientists who study how drugs change the brain, treatment professionals who help recovering addicts lead healthy lives, and kids in danger of becoming the next generation of addicts. Finally, he reports on the ongoing fight to change our national drug policy. Athena has released several programs with Bill Moyers, including Joseph Campbell and The Power of Myth, on Faith and Reason, Genesis-A Living Conversation, In Search of the Constitution, A World of Ideas-Writers, The Language of Life, God & Politics, The Wisdom of Faith with Huston Smith, On Our Own Terms, Amazing Grace, and Capitol Crimes.